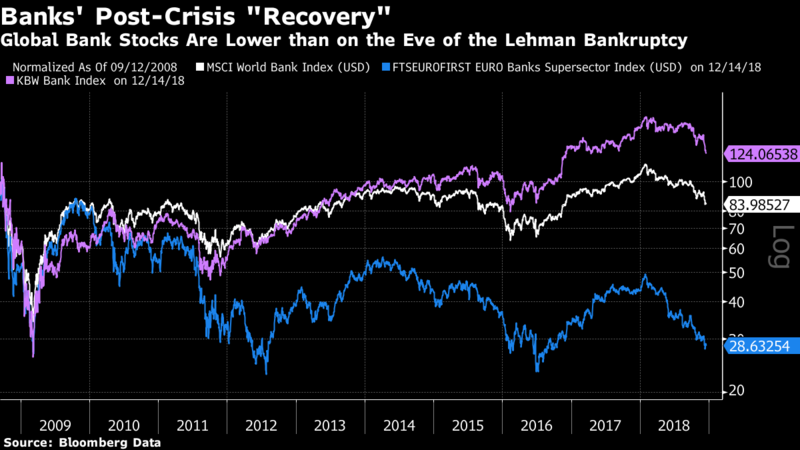 „(…) this chart, on a log scale for clarity, shows that world banks as a whole have this year shed all the very small gains they had made since the weekend before Lehman. U.S. banks still have gains of 24 percent (not great for a decade); and the banks of the euro zone, convulsed by the sovereign debt crisis and still unable to right themselves, are now approaching their worst levels since the crisis. As far as shareholders are concerned, the global banking system is no healthier now than it was immediately before Lehman went down.“ – bto: Ja, und es ist auch nicht gesünder, weil die Krisenursachen nie bereinigt, nur verschleppt wurden! 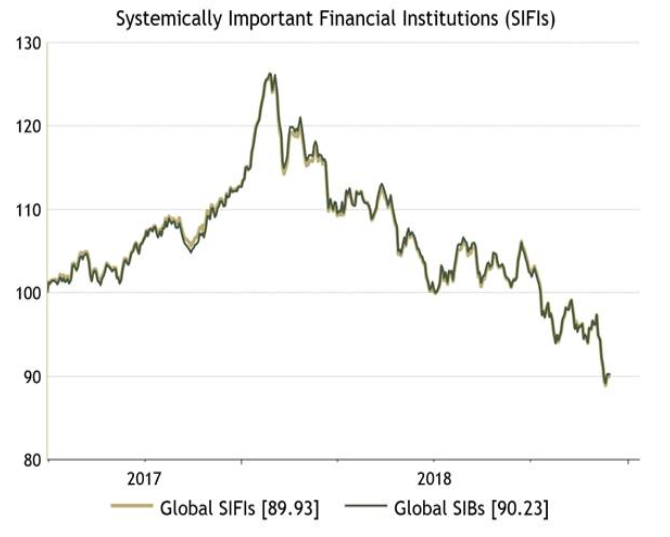 The „(…) SIFIs (systemically important financial institutions) (…) are required to have a strong buffer of capital and to be run in a relatively conservative manner. As their failure is regarded as unconscionable by regulators, they should also be regarded as safe bets not to fail. But this, in a chart provided by Absolute Strategy Research of London, is how their shares have performed over the last two years.“ – bto: Ja, warum haben sie es denn? Weil wir wissen, dass sie eben nicht solide dastehen. Damit verbunden ist die Gefahr für Aktionäre und Kreditgeber, morgen bei einer „Rekapitalisierung“ zur Kasse gebeten zu werden. 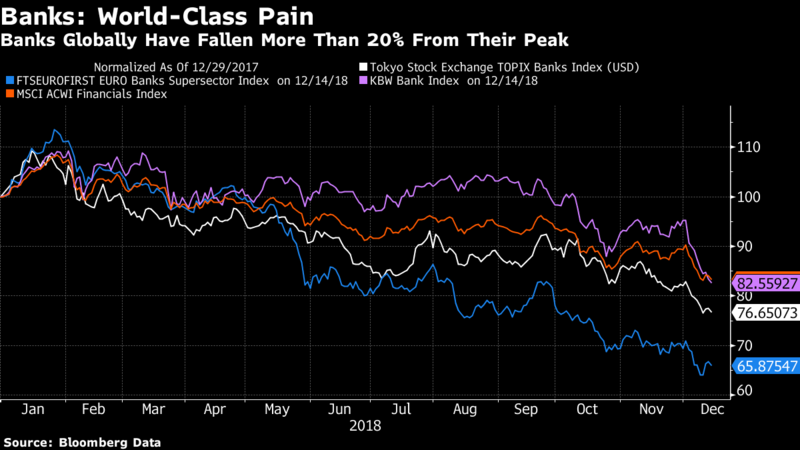 „Financials have been bumpy ever since the crisis, and previous sell-offs have provided great buying opportunities for U.S. banks – even if it would have been better to stay away from banks in the euro zone. (…) this is about a squeeze on liquidity, and in particular a shortage of dollars. Even if central banks don’t believe that there is a credit crisis, because spreads aren’t widening, he argues that financials are nevertheless in crisis. Until central banks start to add liquidity, or the dollar falls, investors should stay cautious (…).“ – bto: Es zeigt aber nur, auf welch schwachem Fundament das ganze Bank- und Finanzwesen steht. 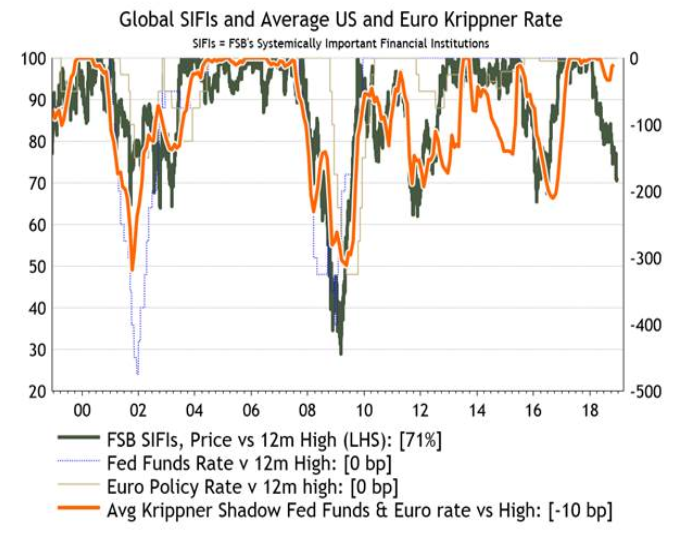 „The following chart compares sell-offs in the SIFIs with the Krippner Rate. (…) this is an effective shadow rate, showing the interest rates implied from longer-maturity yields and the shape of the yield curve once the lower bound for interest rates has been reached. In other words, it takes into account the effect of unconventional measures such as forward guidance and quantitative-easing effects, now being replaced by quantitative tightening.“ – bto: Weil die Liquidität knapper wird, geraten die Banken unter Druck. „Unless a recession is imminent, it looks fair to blame quantitative tightening by the Federal Reserve, in combination with the huge amounts of wholesale funding that big banks require.“ – bto: Ich betrachte es einfach nur als Fieberthermometer eines kranken Systems. Insgesamt eine abwägende Sichtweise, die ich teile.